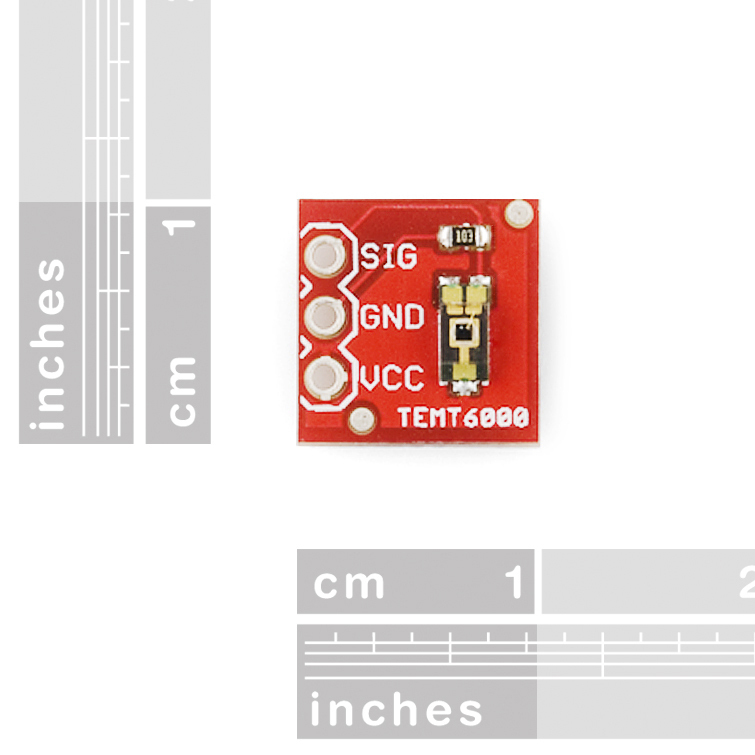 Basic breakout board for the TEMT6000 Ambient Light Sensor. Only what you need, nothing you don't. 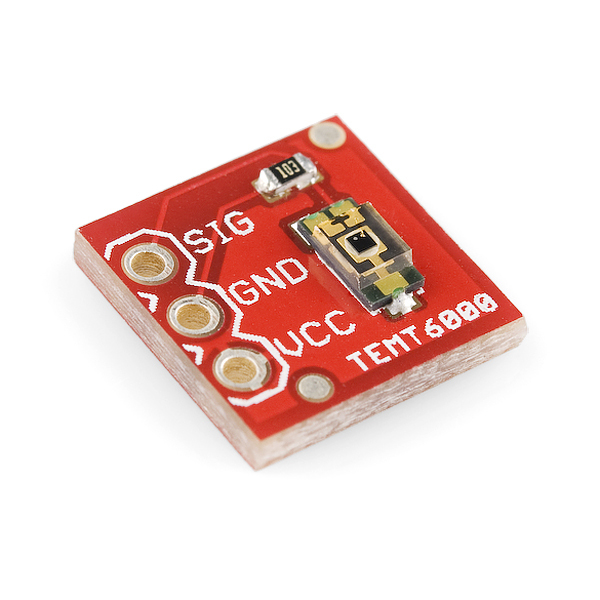 Sensor acts like a transistor - the greater the incoming light, the higher the analog voltage on the signal pin. I had a question about the output this sensor gives off... I'm using it with a basic stamp 2pe microcontroller and haven't been sure how to convert the analog output into lux. Is there a specific equation I have to use for this or are there several (like ones that include temperature, etc)? Although the datasheet does not provide this information, an email to Vishay got some dynamic response data. The upshot is that for the fastest response to changing light conditions one must have a high current flowing through the device. Icmax is defined at 20ma. With the 10K resistor (assuming no current out the signal line), and a 5 volt supply, than the maximum collector current is 5/10K or a tiny 500 micro amps. At this condition, rise and fall times are around 15 micro seconds. Increase Ic (by lowering the value of the resistor) and you can drop the times to bellow 10 usec. Suggestion: Why not use the regular G/V/S layout for pinout? Gnd / Vcc / Signal? Then it'd match practically any servo connector wire pinout. Yes, I'm using it at 3.3v. Just keep in mind, the current out of this thing is small; I'm buffering it using an op-amp. I am using 5v with an arduino mega and this unit really impresses me. 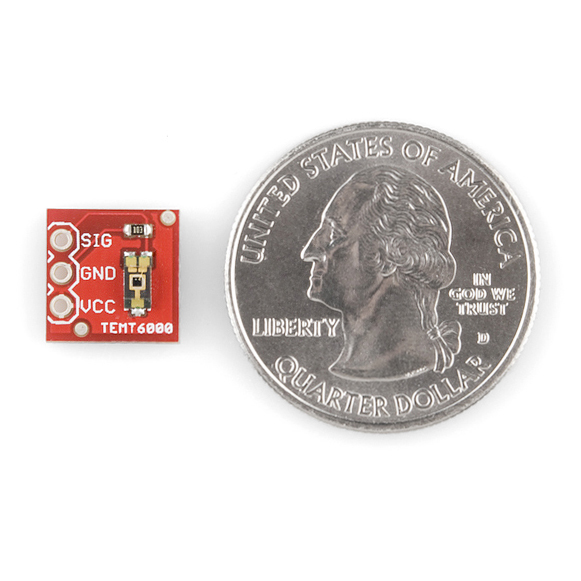 Note that this sensor reports close to 0v even when in moderate light, and you must use a bright light to get 5v out. UPDATE: This sensor also has a very large light receiving area as even lights pointed at it from the side trigger high readings. Still happy with it! 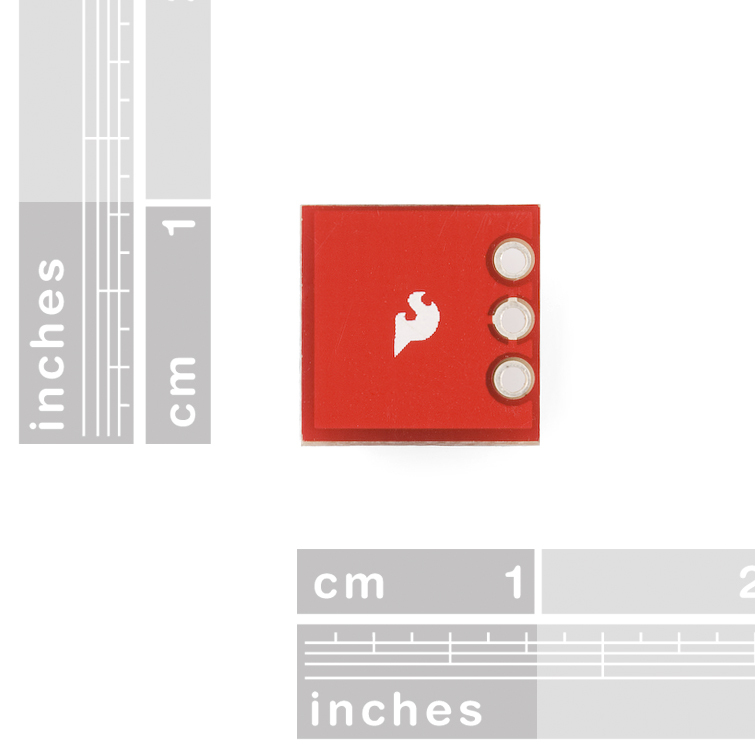 SFE, how about a breakout board with this sensor and a logarithmic amplifier? I don't care for the difference between 100 lux and 105 lux, which you won't notice anyway, but I do care about the difference between 10 lux, 100 lux and 1000 lux. Log amp, please! 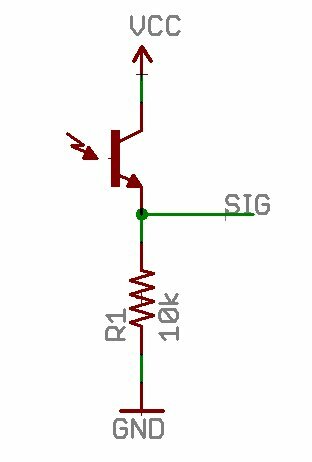 why use this instead of a photoresistor? With a photoresistor you build a voltage divider which is anything but linear, this one is linear. Also, a phototransistor has a much wider range and is faster. Phototransistors are being used to trigger slave strobe light in photostudios, a photoresistor is orders of magnitude too slow for this. Yeah, I'm kinda wondering the same thing. why 10k resistor? how to calculate this? Would i have to buy the sensor itself? or does it come with the breakout board? It comes on the board. Yes, the sensor is in place on the pcb. Technically yes (you will get HIGH and LOW for certain amounts of light), but I suggest that you use analog to get an exact value. Would this be a good device for measuring and data logging sunlight in a garden? Also, is there a waterproof version, or a good way to waterproof this without diffusing the light from hitting the sensor? Thanks! Would anyone happen to know the bandwidth for this summabitch? I haven't been able to find it anywhere, including Vishay's website. The data sheet shows an input capacitance (C) of 16 pF. The breakout schematic shows a 10K resistance (R) in series. R*C = 160 nS; the RC time constant. Lets call it 200 so that 5 time constants is 1 microsecond. So my, rough guess, expectation is that you should be able to get at least 500 kHz "bandwidth". My guess is that it would handle any "fast" Arduino project, for example a lightning flash sensor. Another post (Skye) indicates a 15 usec response. Still fast enough for most general light sensing. I think its time for me to get one and test it! I'm using it as a trigger in a spectrometer, gives the go signal when the emission starts. Remarkable. I swapped this in place of a potentiometer in my Arduino project and it worked exactly as expected without any changes. It's great to have this as a breakout. Now I have to modify the software to provide some dampening. I'm using it at 3.3v (with a "mbed - LPC1768 Development Board" bought on Sparkfun as well). Just works. Anyone know if this will work at 3.3V? Yes, but you should then set your analog voltage reference to 3.3v for a more representative result. Yes it will. The series resistor determines the output voltage. If there's so much light that the output would want to go higher than 3.3V, decrease the resistor value. Good board and clear hookup instructions. Worked great for my project! I got the items in less than 4 business days. very fast shipping and the item worked perfectly.